Nahe, 17 m. W. of Mentz; pop. in 1871, 5,936. A famous wine called Scharlachberger is produced upon the neighboring Scarlet or Scharlach mountain. Near Bingen is the Bingerlocb, or Bingen hole, a compression of the Rhine into a narrow strait between towering rocks. High above them rises the Mausethurm, or mice tower, so called from the legend that Archbishop Hatto of Mentz, who used it as a granary for speculative purposes during times of famine, was gnawed to death there by mice in 969. According to another tradition, the original name of the tower was Mauththurm, or toll tower. This tower was in a very dilapidated condition till 1856, when it was restored. The picturesque aspect of Bingen is enhanced by the adjoining Rupertsberg, with the ruins of a convent, and the Rochusberg, upon the summit of which stands a chapel, annually visited by pilgrims, as well as the ruins of an ancient castle, where in 1105 the German emperor Henry IV. was imprisoned by his son. In the time of the Romans the town formed part of Belgic Gaul. The castle built by the Romans upon the Rochusberg bore in the middle ages the name of Klopp castle. The name of its principal tower is Drususthurm. 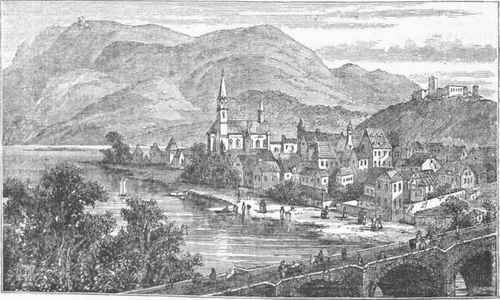 Hence the name of Drususbriicke applied to the beautiful bridge over the river Nahe. The Nibe-lurtgerbhort, or the treasure of King Nibelung, which gave the name to the celebrated Nibe-lungenlied, was, according to tradition, sunk in the Rhine not far from Bingen.